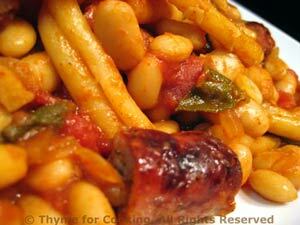 Pasta with Sausage, Sage and Beans, Thyme for Cooking simple one dish dinner. Slice sausages into 1" (2.5cm) lengths. Roughly chop tomatoes - reserving all juice. Heat oil in large nonstick skillet over medium-high heat. Add chili powder and sauté 1 minute. Add onion, pepper and sauté 5 minutes. Add sausage, garlic, sage and sauté until sausage is browned, 5 - 7 minutes. Add tomatoes, their juices, and the cannellini, turn heat to low and simmer 10 minutes. When pasta is done, drain and add to skillet, stir to combine and serve.